Stock Size Office Partitioning and Toughened Glass Made to Measure AXIS Glass stocks a wide range of fixed size toughened glass partitions for home and office. We can deliver our stock size panels within 7 days to anywhere in the England and Wales, and within 21 days to Scotland and N Ireland. Tempered or Toughened Glass can be used for a variety of different functions, including Glass Partitioning , Wet Room Shower Screens and Glass Balustrades. All our glass partitioning and shower screen glass products are held in stock and are ready for immediate dispatch or collection within 24 hours of placing your order. 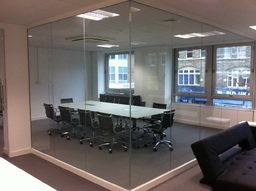 For help or advice with installation please see our helpful Glass Partitioning FAQ page. We also have a selection of glass installation videos and glass installation animations to help our customers understand how all the glass partitions, glass partition hardware, full height frameless glass doors fit together. If you are looking for a glass partition installer in your area please see our glass installation installer database.